More than 40 world leaders and 3.7 million people have taken part in unity marches across France after 17 people died during three days of deadly attacks in Paris. Up to 1.6 million are estimated to have taken to the streets of Paris. World leaders joined the start of the Paris march, linking arms in an act of solidarity. The marchers wanted to demonstrate unity after the attacks on satirical magazine Charlie Hebdo, police officers, and kosher supermarket HyperCacher. The French government said the rally turnout was the highest on record. The rally, led by relatives of the victims of last week’s attacks, began at the Place de la Republique and concluded in the Place de la Nation. Several other French cities also held rallies. The interior ministry said turnout across France was at least 3.7 million, including up to 1.6 million in Paris – where sheer numbers made an exact tally difficult. 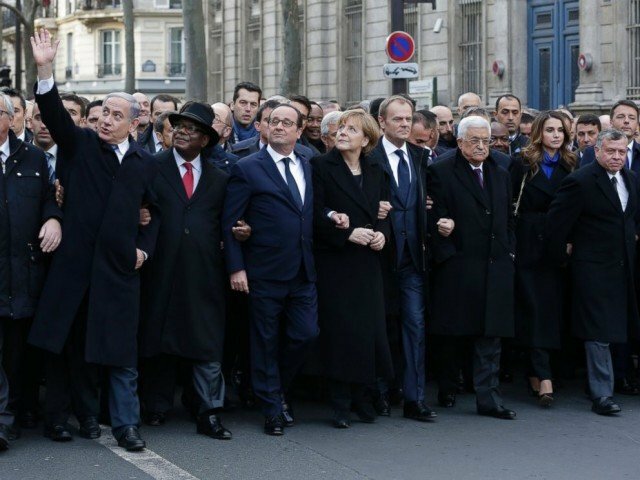 World leaders, including UK PM David Cameron, German Chancellor Angela Merkel, Israeli PM Benjamin Netanyahu, Palestinian President Mahmoud Abbas, Malian President Ibrahim Boubacar Keita, EU President Donald Tusk, and Jordan’s King Abdullah II joined the beginning of the Paris march. “Paris is the capital of the world today,” French President Francois Hollande said. The leaders observed a minute’s silence before the march began. About 2,000 police officers and 1,350 soldiers – including elite marksmen on rooftops – were deployed in the capital to protect participants. The Paris march was split into two routes for security purposes. Marchers chanted “liberte” (“freedom”) and “Charlie”, in reference to Charlie Hebdo magazine. Some waved French flags, cheered, and sang the national anthem. Solidarity marches were also held in world cities including London, Madrid, Cairo, Montreal, Beirut, Sydney and Tokyo.